“Our company has been through total chaos over the last year, and we have made a miraculous recovery,” said Eric Fankhauser, Toledo Metal Spinning Company vice president. The award was presented at the U.S. Chamber of Commerce annual meeting in Washington, D.C.
A fire, fanned by nighttime winds, destroyed 95 percent of the firm’s manufacturing equipment and 80 percent of its manufacturing space on February 4, 1998. After an investigation, the cause was deemed unknown by both the insurance company and the city fire investigators. The loss exceeded $10 million. More than 70 years of tooling and job development, quality inspection gauges, several new pieces of equipment, and many records, files, and history were annihilated by the fire. “Within the first 24 hours of the fire, our management established two priorities in order to survive this catastrophe,” Fankhauser said. 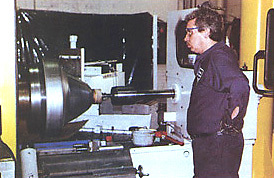 “The number one priority was to keep our customers informed and in business at whatever cost. The second, to retain our employee base. I cannot overemphasize how important employee retention was. Our business is very skill oriented. It took many, many years to train our existing employee base. A good percentage of employees are second- and third-generation workers. It was imperative in order to continue the business that each and every employee was involved in the rebuilding process. 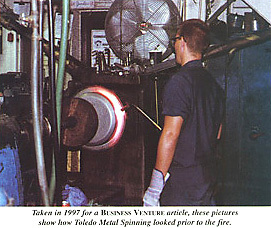 Toledo Metal Spinning is a privately held company, owned by Ken, Craig, and Eric Fankhauser.